This epic work is one of the most tragic of Thomas Hardy's stories. The novel comes full circle as Michael Henchard rises from poverty and drunkenness to wealth and position, ultimately to die poor and bitter. The Mayor's own story is linked to the almost mythological struggle of the old with the new, as his power, his business and even his love for a woman are challenged by the young and thrusting Donald Farfrae. Progress must ultimately triumph over the old way of life, leaving Henchard defeated and disgraced. 1. DRINK AND DISASTER. Michael Henchard, with his wife Susan and their baby daughter, approaches a village, seeking work. A fair is in progress; the family enter a tent selling furmity (a milk drink) and Henchard has rum added to his. He becomes very drunk, and on seeing an auction puts Susan up for sale. A sailor buys her five guineas Henchard falls asleep. When he wakes, repentant, he swears that he will not drink for 21 years. 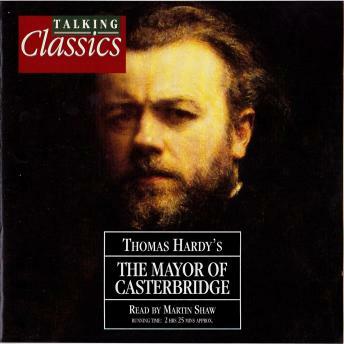 Long after, Susan returns to the same spot with her grown-up daughter Elizabeth-Jane and learns that Henchard went to Casterbridge, Once there, she is amazed to find that he is Mayor. 2. FRESH STARTS. Donald Farfrae, a young Scot, is passing through Casterbridge at the same time as Susan arrives. He overhears the Mayor say that nothing can be done about the rotten wheat he has been selling and sends him a formula for saving it; Henchard is so impressed that he appoints Farfrae as manager of his business. Elizabeth-Jane calls on Henchard, who is moved by her revelation that his wife has returned, the sailor who brought her being presumed dead. He sends Susan a note containing five guineas to buy her back and arranges to meet her secretly. They agree not to reveal their past and to remarry. 3. PARTNERS QUARREL. Henchard confides in Farfrae, admitting both his past treatment of Susan and his liaison with, and subsequent engagement to, a woman in Jersey. Henchard re-remarries Susan who, like her daughter, enjoys life in their comfortable new home. The corn business also thrives under Farfrae's management, but the two men argue. Soon after, on a special day, Farfrae organises a fair. Piqued that he was not been consulted - and did not think of its first - Henchard organises his own fair, which is rained off. By contrast, Farfrae's is a success; he even dances with Elizabeth. In a fit of anger, he sacks Farfrae and forbids Elizabeth to see him again. The Scot then starts his own corn-dealing business. 4. TRUTH CONCEALED. Susan Henchard falls ill and dies, an event which draws Henchard and Elizabeth closer. He decides to tell her the truth - as he knows it - and explains that he is her father, to her great shock. However, Henchard discovers from a letter which Susan left that his own daughter died in infancy, and that Elizabeth's father is Richard Newson, the sailor who bought Susan, but his behaviour towards Elizabeth changes for the worse. Bewildered, she is weeping by her mother's grave when she meets a lady who invites her to live with her as her companion. 5. LOVES CROSSED CURRENTS. Henchard's ex-fiancée, Lucetta Templeman, send him a letter announcing her arrival in Casterbridge, then another saying that she has persuaded Elizabeth to live with her in High Place Hall. Henchard, feeling his old ardour rekindled, calls on her but is told to return the next day. He then writes to Farfrae, giving him to permission to woo Elizabeth again. Next day, Farfrae goes to High Place but sees Lucetta, not Elizabeth. She herself was expecting Henchard but, after meeting the Scotsman, falls in love with him instead. She than refuses Henchard's proposal of marriage. Henchard tells Farfrae that his former fiancée has now refused him, but the latter does not realise that she and his beloved are one and the same. 6. RUIN. To avenge himself on Farfrae, Henchard appoints a new manager, Jopp, and plans to corner the corn market, anticipating a poor harvest. But the harvest is good and Henchard is half-ruined. Soon after, the old furmity seller appears before Henchard in court and accuses him of having sold his wife years before. Lucetta when she hears the story is appalled. Henchard pressed for money, asks Lucetta to announce their engagement, so her wealth will secure his credit. She replies that she has already married Farfrae. Both Henchard and Elizabeth have lost the ones they love. 7. DISGRACE AND DEATH. Henchard's affairs go from bad to worse and he is bankrupted. Meanwhile, Farfrae is made Mayor, but rumours of Lucetta's past liaison spread rapidly and a 'skimmington-ride' is planed to humiliate her. When Lucetta sees the effigies of herself and Henchard hauled though the streets, she collapses and dies. 8. FINAL DECLINE. Elizabeth is asleep in Henchard's cottage - he has had to leave his large, expensive house - when a stranger calls. It is Newson; he has heard that Susan is dead and Henchard tells him that Elizabeth is too. Newson leaves Casterbridge, and Henchard and Elizabeth set up shop together. But Farfrae starts wooing Elizabeth again and Newson returns. Henchard making off before Elizabeth learns the truth. Henchard goes to Elizabeth's wedding party with a gift of a goldfinch, but she rejects him. Soon after, she is stricken with remorse and sets off with her husband to find him - but Henchard dies before they reach him.